This tour is similar in some ways to the Lhasa Kailash and Guge Kingdom tour mentioned on this web site, it differs in the respect that on this tour we rest up for a trek to Everest Base Camp in Tibet. A journey to the Guge Kingdom is probably the most interesting tour available in all of Tibet and the highest ancient kingdom in the world. Legend has it that in the first half of 20th century the Tibetan government sent a soldier to Guge to collect taxes. However, a couple of days later the soldier returned in a very frightened state, he told the govenor that all he could see there was a world of sand. On hearing this the government dropped the taxation plan. Guge is barren, desolate and inaccessible for all but the very hardy. The kingdom became an extremely powerful one and it survived for over 700 years from the 9th to 17th century. Altogether 16 kings ruled Guge and yet historical records reveal little about its rise and sudden demise. It was only from letters by western missionaries that people got to know more about the lost empire. Records show that Guge once made great religious and economic achievements. However its glory was reduced to pieces when the mighty kingdom was involved in a fatal war in the 17th century. The invasion of the neighboring state Ladakh coupled with a domestic rebellion of Guge monks, brought the kingdom to its knees. The ruins are the only visible legacy Guge has left behind, they extend from the mid-ridge of a hill 300 meters high at its peak and cover an area of 720,000 square meters. Archaeologists have unearthed 445 earthen and wooden structures, 879 caves, 58 blockhouses (a kind of fortification building), four secret tunnels, 28 stupas (traditional pagoda-shaped Buddhist monuments) along with granaries and weaponry storehouses. An added bonus of this tour is a trip to Mt. Kailash. 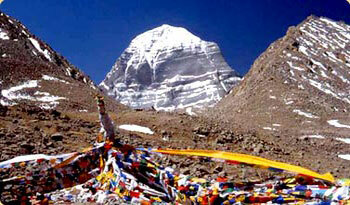 This holy mountain is popular among both Buddhists and Hindus and worshiped by both. Day 11 Darchen Car trip to the Selung monastery, Gyangdrak monastery and overview point of Nandi.